Clear Health Analytics | Are Wellness Programs A Benefits Savior? Are Wellness Programs A Benefits Savior? Wellness programs offer cost reductions and employee incentives that drive engagement. But can they save the current state of rising healthcare costs and workers’ reliance on greater employer benefits? For quite a few years now, one standard answer to rising healthcare benefits costs for employers has been “wellness programs.” Seems intuitive: improve employee well-being (fitness, stop smoking, etc. ), and healthcare costs will fall. Insurers and insurance brokers have launched incentives for employee participation in biometric screenings, smoking cessation programs, gym memberships and fitness trackers, and employers have been all-in. But will wellness programs save the conundrum that employers find themselves in, where health insurance costs are rising right alongside employee reliance on more benefits? THE LONG GAME – DOES IT PAY OFF? Cost, engagement, and culture : Wellness programs are a workplace benefit that bring a lot to the table. But are wellness programs actually meeting employer goals? At the surface, wellness programs encompass a broad range of employee benefits. These may include gym stipends, screenings, company-sponsored health activities and even financial incentives. Measuring the benefit of a wellness program takes years; many of the initiatives are considered a “long-game” for companies that participate. It’s difficult to ensure that enough employees take advantage of the programs offered to make them effective, leading some to wonder if wellness programs really work. Recent studies suggest wellness programs fail to meet their two primary goals: better health and lower healthcare costs. “It turns out that those most likely to take advantage of their employer’s wellness offerings are healthy people who don’t spend a lot on health care, and employees with the highest health-care costs are the least likely to participate,” reports Bloomberg, citing a recent study by the University of Illinois at Urbana-Champaign. Essentially, those who need wellness programs the most are least likely to participate in them, even when financially-incentivized to do so. Bloomberg reports that slightly fewer than half of employees completed a health assessment and screening without financial incentive, and that number only raised to 63% when $200 was offered. Despite that, a Willis Towers Watson survey says that employees do expect to earn financial incentives for participating in wellness programs. It’s estimated that 86% of employers incentivize wellness program participation by offering money. The disparity between research and surveys tells us that there are some benefits to wellness programs that aren’t immediately measurable. 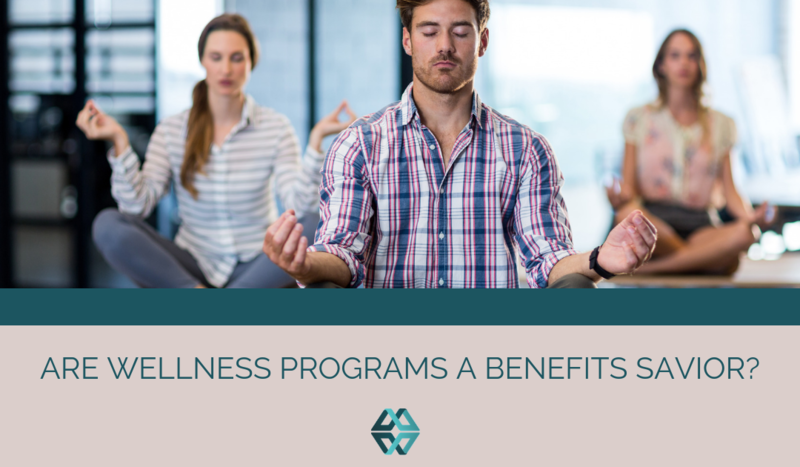 If you understand how wellness programs help, you’ll be able to offer healthcare benefits that fit into your overall employee benefits package nicely without leaving gaps. A great wellness program won’t replace good insurance, but personalizing healthcare for your employees will improve both. With prevention at the focus of your employer-sponsored wellness plan, you can create incentives for your employees to improve their health. “Targeting and preventing [chronic] diseases could have a major impact on ever-increasing healthcare spending. However, just motivating and incentivizing changes in behavior might not be enough for everyone,” reports FierceHealthcare. “Individuals are struggling to understand the health care system and how to best use their health and well-being benefits,” says National Business Group on Health. There are some factors, like socioeconomics, that most wellness plans can’t address. Yet, these factors may contribute to poor health in a way most wellness incentives can’t even touch. Leana Wen, commissioner of health for the city of Baltimore, asked at AHIP 2018, “In Baltimore, one in three African Americans live in a food desert. How can we tell them to eat better when the closest food to them is junk food?” She went on to add that it’s easy to correlate areas of the city that have low life expectancy with high poverty, infant mortality, cardiovascular disease and cancer. One area showing promise is short-term wellness interventions, says Healther Payer Intelligence. Clinical studies are few but positive, with benefits to both employees and employers seen as better than more traditional wellness program approaches. One study measured how wellness coaches that were brought in for a 2.5 day immersive worksite-based sessions led to a improvements in BMI, glucose, cholesterol, and blood pressure. Could the success of these shorter but more focused wellness initiatives make a greater change than say, company nap rooms? It may be too soon to tell. Regardless, benefits directors have a lot to consider when building packages that meet the needs of the modern workforce.